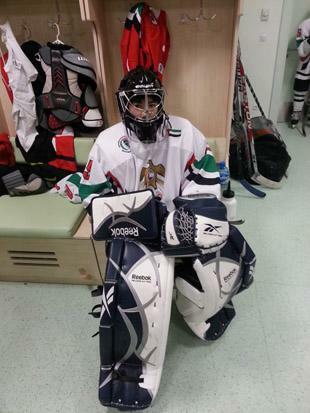 Pictured: Alexander Medearis in the UAE locker room. Exhausted, Alexander Medearis watched the puck drop for what he assumed would be the final centre ice faceoff of the night, as only a few seconds remained in the game, if you could call it a game: His club, the United Arab Emirates U17 team, trailed the HC Silver Lions from St. Petersburg 59-0. Medearis, 14, had been in net for all 59 goals, surrendering one nearly every minute during a game that was played almost exclusively in his end. St. Petersburg had tested him over 200 times at that point: 81 shots in the first, 57 in the second and 66 in the third. Yes, the Silver Lions actually shot more in the final period than the second. They scored more too. While most clubs might have shown a little sportsmanship and eased up at some point after they took, say, the 16-goal lead the Silver Lions had after 20 minutes, the Russians just kept coming. They poured it on in the third and even found another gear inside the final minute, scoring twice in the last 25 seconds. When the official dropped the puck at centre ice following their 59th goal, Alexander could only watch as the Silver Lions won the draw and charged straight ahead. They faced little resistance from the Emirati skaters (just as they had for much of the game but even moreso now as the boys, trailing by 59, checked out in the dying seconds). Soon, St. Petersburg was charging into the UAE end on another odd-man rush. They beat Alexander and the clock for one last goal. When the final horn sounded, the score was 60-0. How did Medearis get into this predicament, watching 60 shots fly by him? It all started with a phone call, and a president that wanted a desert nation to become a hockey powerhouse. "Congratulations!" said the voice on the other end of the phone. It was a director from the United Arab Emirates sports committee. "Your son!" the man exclaimed to Jeff Medearis, Alexander's father, "he's been selected to represent the UAE!" It wasn't a phone call the Medearis family was expecting. "I was sitting at home and there was a phone call, and I was on the team all of a sudden," Alexander recalled. Alexander grew up playing hockey in Wisconsin for the Ozaukee Youth Hockey Association “Ice Dogs”. His mom, who was born and raised in China, had seen ice hockey on television and, on a whim, decided to sign him up for it. Last year, his father's work took him to the UAE capital of Abu Dhabi. There, the Medearis family found him a club team, the U15 Dubai Sandstorms, and later switched to nearby Abu Dhabi Storms. Both clubs are predominately comprised of Canadian skaters with a few from other countries. Apart from proximity, the Abu Dhabi club offered more practice time, as well as the same European coaches that coach the UAE National Team. This phone call was the first time he'd ever been invited to the U17 squad, which would be comprised, in this instance, almost entirely of UAE skaters. 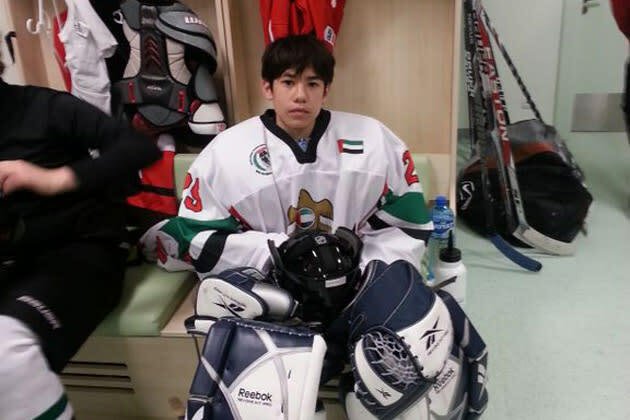 Alexander had been chosen to play goal for the UAE in the U17 Turkmenistan President's Cup, the first ever international tournament in Turkmenistan. It began in just a couple of weeks. The sports committee director said that they'd send a letter to his school excusing him. All his expenses could be covered, and Alexander later learned that it was actually Turkmen president Gurbanguly Berdymukhammedov who picked up the hotel and meals. Berdymukhammedov assumed leadership in Turkmenistan in 2006, after the previous president-for-life, who had been in charge since the country became independent from the Soviet Union in 1991, died of a sudden heart attack. Berdymukhammedov took over as acting president immediately, promising reform and democracy. He officially won election on February 11, 2007. Some have suggested it was a fraudulent election, and you can see why they might suspect as much. Berdymukhammedov became acting president because Öwezgeldi Ataýew, who was originally supposed to assume the role, had surprise criminal charges filed against him the same day as the president-for-life's death. The Turkmen constitution barred the acting president from running in the upcoming election. Within three days of the transfer of power, that was changed. Berdymukhammedov won the 2007 election with a reported 89 percent of the vote. It's important to note that, like North Korea, Turkmenistan's media is run by the state. This may help to explain how, in 2012, Berdymukhammedov could be re-elected with a reported 97 percent of the vote. Turkmenistan claims to be a democracy, but it still has the smell of a dictatorship. Berdymukhammedov did give the Turkmen people some of the reform he promised, however, especially when it comes to recreation and culture. He opened the country up to the West, re-embracing the opera, the ballet and the circus, all of which had been banned under the previous regime for being "insufficiently Turkmen". He also decided that even though his country was four-fifths desert, Turkmenistan was going to become an active, winter sports power. Hockey was the focus, and the people were told that they were to either play it or learn to like it. 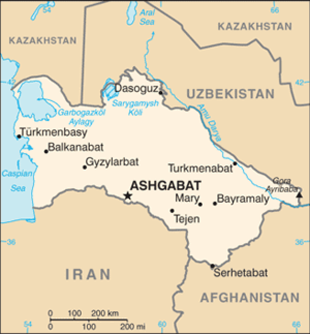 In 2009, Turkmenistan announced a $176 million contract with a Polish company to build a Winter Sports Complex in the capital city of Ashgabat. 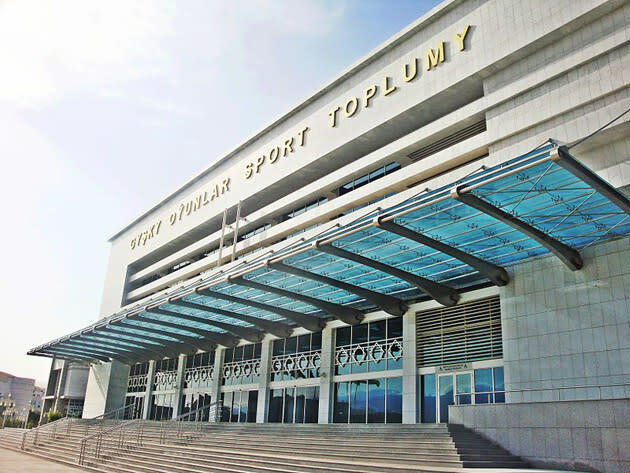 Turkmenistan celebrated the facility's grand opening in Oct. 2011, showing off the international sheet of ice, second training sheet, seating for 10,000 spectators and press row for 100 media members inside the complex. The following April, the president signed a bill stating that the country would hold an international junior hockey tournament, the President's Cup, every February. It would coincide with State Flag Day, one of the country's most important holidays. The first tournament the featured eight under-17 squads. Four were very good: a club team from Belarus and three club teams from Russia, including the HC Silver Lions from St. Petersburg. These clubs were likely convinced to come when they learned of the $50,000 in prize money to be handed out to the gold, silver and bronze medalist teams. Rounding out the eight were two clubs from Turkmenistan, a team from Turkey, and the late-assembled team from the United Arab Emirates for which 14-year-old Alexander Medearis would be minding the net. The tournament began with a dazzling opening ceremony, featuring singing, ice dancing, figure skating, hundreds of waving, green Turkmen flags, and 10,000 colour-coded spectators. It was a spectacle. According to this website, the audience was made up largely of students and conscripts forced to attend. After the ceremony, the teams took to the ice, and it quickly became apparent that the UAE was in trouble. "It was clear very early on that my team was in over our heads," Medearis said. In the opening round robin game versus Belarus, the Belarussians jumped out to a double-digit lead in the first period. "It was a shock, I guess, for my whole team and me including," Medearis said. "They were demolishing us. It wasn't even a challenge." The UAE ambassador to Turkmenistan, who had played a role in arranging his country's participation in the tournament, tried to inspire the troops from behind the player's bench. "You must shoot more!" he shouted in his Kandora. "Be strong! You must shoot more!" Of course, shots from the UAE zone weren't going to threaten the Belarussian netminder, and that's where the puck spent most of its time. The only thing that kept the score in that first game respectable (if you can call 21-0 respectable) was a showing of sportsmanship. "After [the first period], they played a lot of keepaway," Jeff Medearis said, "practiced their passing, then they only took super quality shots, and they took some shots where they shot it at Alexander's pads. That coach had some respect." After the game, UAE coach Juhani Ijäs spoke to his players. He told the boys to learn from the other teams, to observe how they pass, enter and exit zones and defend, and try to incorporate those skills into their own game. Alexander Medearis recalls, "One of the biggest things [Ijäs] said was, 'Look, I don't care what the score is at the end. I want you playing your hardest until the final horn sounds." Next up was the Turkmen team, Oguzkhan HC, who were suspiciously good for a group of boys that had only been playing the game since their president's edict a few years ago. The reason? The club was loaded with ringers, according to an observing Jeff. "The first two lines were all Russian, and one of their defensive lines at least, if not both. Their third and fourth line guys were Turkmen, and I think their second goalie. Just like the prior game, they jumped up 10, 12 goals. Then they swapped the goalie out, they put the Turkmen goalie in, and they started playing the third and fourth lines, and the UAE put in four goals. It was almost competitive. Then they promptly put the Russians back in and they ran the score up to 30." The final score was 31-4. From the sounds of it, that game exposed the tournament for what it was. This wasn't simply a celebration of the game or a chance to give the people of Turkmenistan their first exposure to international hockey. It had the feel a propagandized event, designed to give the Turkmens the impression that in just five short years, they'd developed the game to a point where they were on par with elite hockey countries like Russia. Sure enough, after the tournament, the Turkmen media boasted, "The first junior (U17) ice hockey tournament for the Turkmenistan President’s Cup has proved that... Turkmen teams can play versus the representatives of famous hockey clubs as an equal." It's hard not to see lower-level clubs in Groups A and B -- the UAE and Turkey, respectively -- as easy marks, weaker clubs that guaranteed the Turkmen teams in Group A and B would succeed in at least one game. It was the government's way of managing the people's perception, just like they managed everything else about the lives of those living in Turkmenistan. The level of control the government had over the populace was evident all throughout Ashgabat. Jeff spoke of the absurd surveillance that was everywhere, seen and unseen. "Every corner, every area had somebody standing there watching, watching for anything that shouldn't be going on," Jeff Medearis said. "So you always had these people jumping out of everywhere going nyet, nyet this, nyet don't put your foot there. There were people watching the people who were watching the people." The strangest incident befell the minder who had been assigned to the UAE team, a man named Bennettino. One afternoon Bennettino, Jeff Medearis and the club's bus driver waited in the massive, mostly empty parking lot while the kids ate lunch in the mall. Bennettino asked the bus driver for a cigarette, then boarded the bus to smoke it, explaining that it was illegal to smoke outdoors. When the bus driver got on board to turn the bus around, Bennettino got off, the lit cigarette cupped in his hand. "He's only off the bus 30 seconds, and two guys jump out of a car with radios on and suits and give him a ticket." Everything in Turkmenistan was managed. While the UAE's first two matches had featured brief reprieves from the onslaught, either because the team was being sportsmanlike or because they felt it was finally safe to play their local kids, there was no letup in the last game of the round robin phase, when the Emirati boys went up against the Silver Lions. It was a 60-minute assault. "Our defence just couldn't stop them," Alexander Medearis sighed. "They were exceptional at passing, they were good individually... they were unstoppable, I guess." But they also weren't stopping. Medearis added, "They were trying their hardest every line." The 205 shots he faced attest to that. If you feel like poor sportsmanship of this sort deserves comeuppance, rest assured that the Silver Lions got theirs. The Russian club's coach only brought 12 skaters to Ashgabat (presumably so that he'd get a larger share of the winnings). But in their game against Belarus, his hubris caught up to him. He lost two skaters to an injury. Then, in the semifinal game against Moscow, leading 2-0 with 10 minutes to go, he lost another to a 10-minute misconduct. Suddenly, they were severely undermanned. "Their team just got gassed," Medearis said. Just like St. Petersburg had done to the UAE, Moscow saw weakness and went for the jugular. Before the end of regulation, the game was tied. Moscow would go on to win the game in a shootout. Later, they would take home the top prize and the President's Cup by beating the hometown favorite Oguzkhan HC. If only the Silver Lions had conserved some energy versus the UAE. But they had nothing left and they left with nothing. "[The score] didn't really matter," Alexander said. "I was just trying my best and seeing what I could do." He didn't. As a result, Alexander can be proud that he held the Silver Lions to 60 goals. But you can understand why few others on the team shared his sense of accomplishment. The same goes for the the Turkish team, which had suffered three embarrassing losses of their own in Group B. When the two teams were scheduled for one final match, a battle for 7th place, things got heated. A tired UAE club coasted through the game -- "I think the team started checking out," Alexander Medearis said -- and when Turkey turned up the physicality in an effort to escape Ashgabat with at least one win, both sides lost their heads. The game ended in a massive, bench-clearing brawl, an outpouring of the sort of frustration that builds up after a week of being bullied by superior clubs. The UAE lost that game 5-2. Alexander called it the most frustrating loss of the tournament, because unlike the other games, that one was winnable. "The last game," Alexander said, "we could have won, but we chose not to." And then, embarrassed and beaten up, the group headed home, wondering why they had ever gone over in the first place. I asked Medearis if he was happy he participated in the tournament. “I wish we had a stronger team and did better," he said, "but I made a lot of new friends, saw a new country, stopped some pucks from some top shooters, so it was fun. I also learned the Emerati guys are real fighters! I know that much and they will keep skating and improving as they love the game of hockey just like everyone else. Maybe somedaythey will beat a team like St Petersburg." But while the UAE's involvement in this tournament led to disappointment, and they may have been there for all the wrong reasons, the program should be fortunate that Alexander was among them. Thanks to the unyielding effort of a 14-year-old goaltender from Milwaukee, their performance didn't wind up in the record books. Sixty goals is bad, but it isn't historically bad. In 2008, the Bulgaria women's team fell 82-0 versus Slovakia. And in 1998, the South Korea men's team hung the worst loss in international hockey history on Thailand: 92-0. Could the Silver Lions have neared a score like this if Alexander had given up? Maybe. Lord knows they were trying. But Alexander kept trying too, and he held them to 60. In so doing, he may have spared the UAE and its developing hockey program -- which needs successes that inspire more kids to join the program, not black marks that discourage them -- from becoming a punchline in the hockey world. After the game, coach Ijäs made sure Alexander knew his incredible effort hadn't gone unappreciated. "I can safely say you're the first goalie that gave up 60 goals," he told his netminder, "and was still the team MVP."